Ratna Park today is known for its chaotic traffic, microbus stands, and hordes of street vendors selling cheap Chinese knockoffs. Forty years ago, it used to be the city’s cultural and artistic hub and artist RN Joshi’s Park Gallery was at the heart of it all. Started in 1970, Park was Nepal’s first gallery of modern art where Joshi displayed his works, taught classes, and encouraged Nepalis to appreciate their artistic heritage. In 1975 Joshi shifted the complex closer to his home in Jawalakhel, where today Nira and Navin are keeping their father’s legacy alive as well as promoting upcoming artists. Titled ‘Emergence of Nepali Modern Art: 1960-80’, the latest exhibit which runs until 31 January displays works from the sixties, seventies, and eighties that paints a complex narrative of the birth and evolution of modern art in Nepal. Arranged in chronological order, pieces from the 60s are lined up closest to the entrance and a walk further inside the gallery reveals how the artists’ work evolved through the 70s. A staircase leads to the upper level, where works from the 80s are displayed. “The 1960s were a turning point in Nepali art,” says Navin, “Uttam Nepali, Sashi Shah, Vijaya Thapa, Indra Pradhan, and my father went to Mumbai and Lucknow to study, brought back a lot of new influences and pioneered modern art in Nepal." 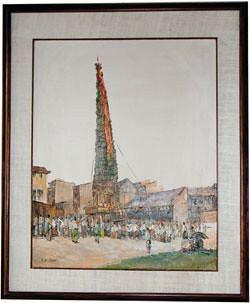 However, even in the 1970s, many Nepali artists chose to play safe and paint landscapes or cultural events which were very popular among the audience. Then, some began taking risks and experimenting with abstract pieces and preparing the art-loving public for the revolution of the 80s. One example is KK Karmacharya’s piece (pic, centre) comprised of many different materials which stand out among the traditional oil paintings. 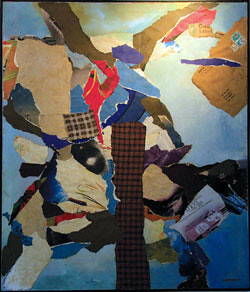 “Karmacharya is part of the second generation artists, who were influenced by the famous five and later developed their own unique styles,” explains Navin pointing to the collage on the wall. As the founder of the gallery, RN Joshi’s works are most prominently featured. Each of his paintings seems to serve a specific purpose. 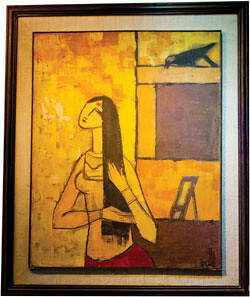 A large painting of a woman brushing her hair while a crow perches on a window (pic, above) is a reference to an old Newari folk tale, reflecting the artist’s desire to preserve Nepal’s oral storytelling tradition through art. His later works document everyday life around him, such as the Rato Machhendranath festival (pic, left) which takes place in Pulchok every year. Among the throng of visitors this week was 16-year-old Dhiraj Bayelkoti, a student of fine art at Bijeshwori Secondary School who came to hear Bajracharya’s talk. In an effort to promote art among young Nepalis, Park Gallery allows free access for students. If the gallery continues to inspire students like Dhiraj, Nepali art is in for some exciting times for the next three decades.